Cruyff Football is the official heir and worldwide guardian of Johan Cruyff’s football legacy. Johan Cruyff is synonymous to innovation. Always surprising and never dull. Turning disadvantages into advantages. Creating something out of nothing. Using each others qualities to come out stronger. Matching freedom with responsibility. Giving chances to youth. Helping those in need. And entertaining the fans. 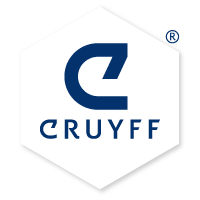 Cruyff Football helps professional football clubs and national federations to play attractive football, produce homegrown players and adopt sustainable football strategies. Together with our clients, we will assess the current level and potential of the club or country and design a plan. Cruyff Football is the guide that empowers clients to work with the Cruyff vision independently.